There's nothing like a good swim to beat the heat during the dog days of summer. New Yorkers famously flock to the sandy shores of Coney Island, Long Beach, Jones Beach, and the Hamptons when they feel like taking a splash, yet Brooklyn and Long Island aren't the only options to consider. Queens has plenty of beaches, public pools, and other venues that offer ample opportunity for a fun-in-the-sun dip, right in the heart of NYC. Here are 10 of the very best places to head out for a swim in Queens throughout the summer season. Summers on Rockaway Beach (immortalized by that catchy Ramones' tune, "Rock-rock Rockaway Beach"), set within the Atlantic-facing Rockaways, are a marvelous time, attracting swimmers, surfers, and sunbathers from all over New York City and beyond. Lifeguards are on duty daily throughout beach season. In addition to plenty of sun, surf, and sand, there's plenty of opportunity to shop, sightsee, dine, and drink along the Rockaway boardwalk. The joys of visiting Rockaway Beach take on extra poignancy given how Hurricane Sandy devastated the area in late 2012. The beach and the boardwalk have since been restored and reopened, and the area both endures and thrives. It's a testament to the resilient New York spirit. Located west of Rockaway Beach in the Rockaways, Jacob Riis Park was named after a New York City muckraker who documented the lives of the poor and working class. It's fitting then that this particular stretch of the Rockaways, which was designed by Robert Moses, was intended as a haven for NYC's poor and immigrant communities. In fact, Moses' vision and Riis' work led the beach to be known as "the people's beach." In addition to the sand and surf, there's ample dining and drinking options along the beachfront today. The landmark former bathhouse of Jacob Riis Park – host to a slate of ranger-led programs and history exhibits – is a notable example of Art Deco style, too. 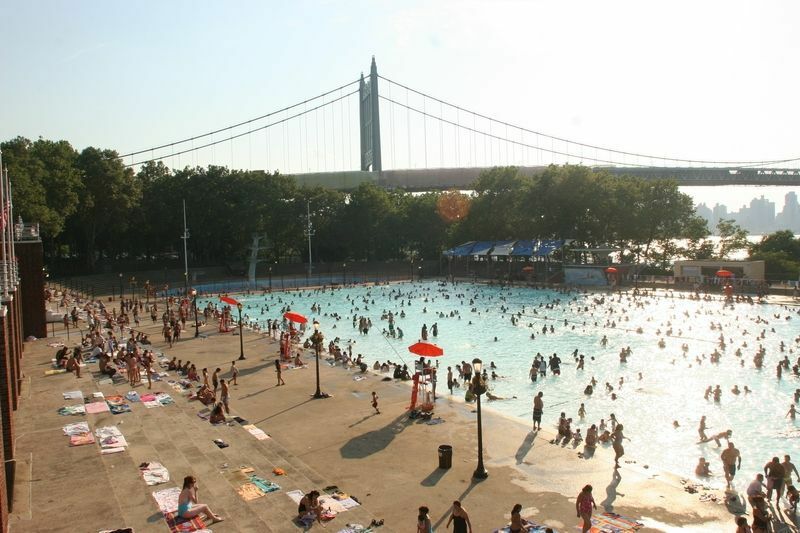 Astoria Park, in Astoria, boasts the largest and perhaps most storied pool in all of New York City. Designed by famed architect/engineer/urban planner Robert Moses, the pool measures 330-feet-long by 165-feet-wide. The vast structure is also the city's oldest pool (opened on July 4, 1936), and was used for Olympic qualifying events in the summers of 1936 and 1964. On warm days, the vistas and people-watching here can be downright breathtaking. Apart from the pool, Astoria Park also has trails, tennis courts, and idyllic views of Randall's Island and Manhattan. Located in East Elmhurst, Fisher Pool was built by Edward Fisher, a man who moved to the area in 1945 and became an active, civic-minded, and beloved member of the local community. Fisher Pool consists of two pools: a larger swimming pool and a smaller wading pool for children. After a dip, perhaps consider taking a look around neighboring Corona or Jackson Heights, which offer diverse cultural experiences that are unique to Queens. Massive Flushing Meadows Corona Park is the historic site of New York City's 1939 World's Fair and 1964 World's Fair. In addition to its many sites and attractions, the park is also home to a giant indoor swimming pool and a separate indoor diving pool that's suitable for use year-round. Day passes and memberships to the pool are quite affordable. Bonus: Purchasing a membership here also includes use of the other 11 indoor swimming pools at NYC Department of Parks & Recreation facilities throughout the city. Rather than brave the beach or deal with crowded public pools, some may prefer a less crowded Queens venue that still provides an enjoyable swimming experience. That's where the Fairview Swim Club may be ideal. Located at the Fairview at Forest Hills co-op, the site offers a large pool and lots of room to lie down and relax after a dip. People may purchase daily tickets to the pool or memberships for the season if they so choose. While no outside food is allowed, burgers, hot dogs, ice cream, milkshakes, and other summer favorites can be purchased at the swim club café. If you're in the Bayside area, the Bay Terrace Pool & Tennis Center (of the Samuel Field Y) is a smart bet. In addition to a large swimming pool that's open all week, the pool boasts special events programming, music on the weekends, and activities for different age groups. Varying membership rates are available for families and individuals. The Samuel Field Y also offers memberships to the Tanenbaum Family Pool, located in nearby Little Neck, Queens. Built around a preserved Civil War fortress, Fort Totten Park might not be the first place someone would think about for a swim. Yet Bayside's Fort Totten Park has a good-sized outdoor pool that's ideal for a dip during the summer months. In addition to the main swimming pool, the park also has a small wading pool, as well as a diving pool. When not splashing about, visitors can sunbathe on the nearby grass, hike along various trails, and perhaps take a canoe out onto the Long Island Sound. A hotel convenient to LaGuardia Airport may not seem like an ideal swimming locale, but the pool at the Courtyard Marriott in Elmhurst is a surprisingly fine option for a relaxing summer swim. For tourists visiting New York City, pool access is part of a room reservation. For residents of Queens, memberships to the hotel's pool are available for the summer months. Bonus: Pool memberships also include access to the hotel's fitness center access, as well as discounted room rates, too. Rockaway Water Park may not offer traditional swimming per se, but it does give people a chance to swim with childlike abandon. This Rockaway Beach attraction includes a "Tarzan Boat," which is a mobile water park complete with diving boards, slides, trampolines, and a rope swing. Think of it as part playground, part ball-pit, and part bounce-house, all set right on the water. Indeed, the colorful Rockaway Water Park adds a little extra character to the welcoming waterfront scene at Jamaica Bay.